Managing your costing, prices, and margins is a never-ending effort that requires continuous updates and a high level of managerial control. Today’s cloud-based ERP and analytics solutions can reduce the complexity of this effort and increase the likeliness of its success. These answers to common costing FAQ will help you get an idea of what you can achieve with modern technology. Some companies use ERP systems that include finance and everything else, and some run their financials and operations in separate systems. What’s the best way? Whenever it’s time to make decisions that rely on complete visibility of all aspects of your business that could impact costs, margins, and prices, you have several basic options. You could access multiple systems to consider all the facts that matter. Or, you can build integrations so you can report on financials in a more centralized manner. Or, implement an ERP system which helps you manage business financials, integrates with other systems, and also connects with other processes in the operation. The easier you make it to base your reporting and decisions on a full view of all business conditions, the better you can minimize risks and maintain profitability in your costing, prices, margins, and promotions. Connected ERP, configured to fit the way your company works, is probably your best choice. What are the tools and resources you recommend for managing costing and margins? 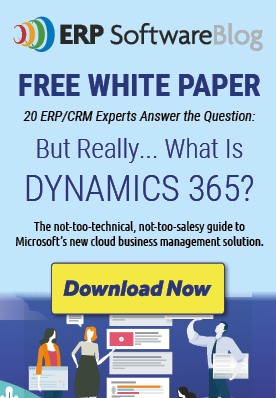 You get the best of powerful, modern, highly usable ERP as well as CRM capabilities with Microsoft Dynamics 365 on the Azure cloud. You can perform all the functions related to managing costing, margins, and pricing in Dynamics 365, including custom pricing schemes for your larger resellers or customers. Using the CRM functionality of Dynamics 365, you can assess the financial performance of your marketing campaigns, promotions, and sales, adjusting what could be improved and repeating what worked well. Power BI, Azure Analysis Services, and Machine Learning are some of the business intelligence tools available on Azure to extend Microsoft Dynamics 365 with data-driven insight about supply chain and market events that can influence your costing decisions. How is ERP in the cloud better than on-premise ERP for managing costs? The overall functionality may be generally the same, but the cloud environment has its own advantages. You might need to access a variety of data sources to consider all the information that matters, such as the internet of things (IoT) with updates on farming and raw materials production, nutritional science, weather, demographics, and market trends, in addition to your company’s financial records. It’s much easier to store and process that wealth of data in the cloud. Also, if you need to give mobile workers or supply chain partners secure access to information subsets and reporting tools, the cloud can greatly simplify collaborations and anytime access. How can I manage costs and margins throughout the life of a product? When you take advantage of cloud-based intelligence and analytics tools in integration with your ERP system, you can use predictive modeling to rehearse possible cost scenarios and pricing structures, combine them with findings on changing consumer preferences, and decide which outcomes you want to pursue. Product-specific reporting will help you take a product into new markets, or present it to additional demographic segments, at the right price with a healthy margin. As the perception of your brand and your product portfolio changes over time, market intelligence findings together with Azure analytics can help you keep products competitive and profitable. When you develop a new product, your integrated analytics and ERP foundation highlight the ways to achieve optimal revenue and market impact. The same tools will also help you transition aging products out of the market before they jeopardize your profitability. How can you help me manage my supply chain? In Microsoft Dynamics 365, you can track the events and business outcomes of your various supplier and vendor relationships and also manage the contracts and collaborations with each of them. You can clearly establish the value of each supply chain relationship, assess vendors’ cost and quality in context, and align their capacities with expected demand. If you develop new products or recipes together with certain vendors, the Azure cloud and its analytics tools provide you with a framework to collaborate, share information securely, and source in the most reliable and economical manner. Can I use your solutions to control the costs of compliance and quality management? You can work with Microsoft Dynamics 365 and Azure business intelligence resources to maintain compliance with quality and regulatory standards with great efficiency, including automated alerts and warnings when deviations happen or become likely. Doing so will streamline your quality and compliance management to always meet the parameters you set, so business managers can take corrective steps when that becomes necessary, but are not required to keep watch when no deviations are in play. When you base quality and compliance management on exceptions rather than routines, you can also reduce its cost and effort. How can we manage costing to be more profitable in managing seasonal or special events or spikes? With cloud-based market analytics and real-time intelligence, combined with production and operational data from your ERP system, you will be able to project the profitability outcomes of various costing and pricing schemes, and configure promotions and sales for best results. With insight into demographics, weather patterns, the competition, and the impact of special events and seasonally changing consumer preferences, you won’t be caught by surprise or tempted to slash prices without regard for what your business can absorb. Instead, you can take advantage of seasonal demand changes and special events to build your brand and satisfy consumer demand at a competitive price. What does Columbus have to offer to food companies that want to improve their costing? We have successfully implemented ERP and other software solutions for a number of food companies, leading brands as well as smaller, growing operations. Our ERP and business analysts know what such software tools like Microsoft Dynamics 365 and Azure analytics can help you achieve in managing your costs, prices, and margins, and they are also familiar with the trends and challenges in the food industry. That enables us to share expertise and best industry practices as we make technology recommendations, help you implement systems, and work with you to make your processes more effective. Having studied many different user scenarios and personalities in a great variety of day-to-day situations, we also know how to enable a productive experience for your people – in the cloud, on-premise, or in a hybrid environment. When it comes to supporting food companies, what is unique about Columbus? We are a customer-centric organization with a global reach, a local presence, and a deep understanding of the business cultures in the world’s regions. Many of our customers are leaders in their field, undertaking business transformation initiatives or implementing innovative technology to become more competitive and ensure sustainable costing and pricing practices. Columbus consultants are experts at understanding and mitigating the risks involved in these efforts, and they know how to adapt costing and pricing models to your business and help you meet your objectives. Start by downloading our free ebook How to enhance costing and pricing of food items. Contact us today if you want to explore what cloud ERP and analytics can help you accomplish. What Does My Organization Do with Reporting and Budgeting When Your ERP is Moving to the Cloud​?